Stuart Pivar has his own lab in New York, Synthetic Life Lab, and he has recently published his first peer-reviewed article in The International Journal of Astrobiology. That's a Cambridge University Press journal, but apparently that does not guarantee a decent review-process at all. 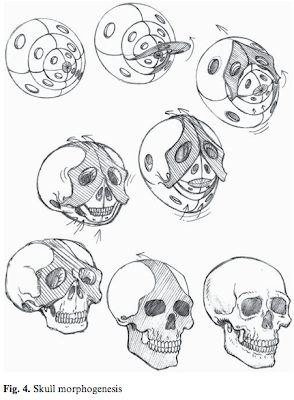 As PZ details, the paper is complete bogus, with no link between reality and Pivar's hypothesis that vertebrate embryos form on the surface of spheres. The paper, The origin of the vertebrate skeleton, is chock full of Pivar's drawings, without any explanation of how he made this dicovery. We know - by looking at actual embryos developing - that this is just not the way a skull forms. And yet the paper was accepted and printed in a serious journal (though, as PZ notes, not really a journal that's a good fit for developmental biology). It will be very interesting to see what happens next. The editor has got some serious explaining to do. My real interest here, however, is how Pivar's enterprise got off the ground in the first place. And lazy as I am, I'm going to do the unscientific thing of stopping right after my initial hypothesis, with apologies (got real work to do, too). There's no conceivable explanation for including this drawing. 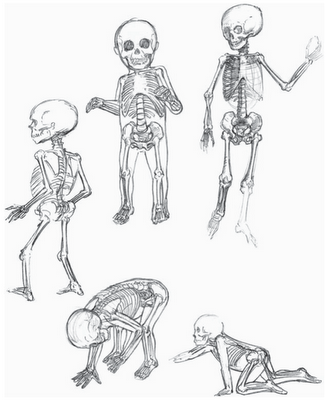 It's just a drawing of a juvenile human skeleton, and it adds absolutely nothing to the thesis of the manuscript. Could it possibly be that Pivar spun a tale of vertebrate embryogenesis based on his own drawings, and then the whole enterprise took off - likely with a multitude of adoration from fellow New Yorkers urging him on - and the fact-checking was relegated to an irrelevant aside? Ms. Matsos, 39, is a biophysicist with a special expertise in looking for fossil life in Martian meteorites. She is a consulting researcher at the National Aeronautics and Space Administration and the editor in chief of Astrobiology Magazine, an Internet publication based at the Goddard Institute of Columbia University. I know someone on the editorial board of that journal. Should I contact him? That would be good. I think putting pressure on the journal any way possible about this paper is advisable. You may as well include NASA and their Astrobiology Magazine because Pivar is now claiming that it has been reprinted there as well. From another artist, xD It looks like he was having fun here. When i'm bored and want tom make my own fun, I draw things repeatedly and come up with other weird ways things could develop, exist.. or whatever else..... This looks a lot like a bored artist having fun.